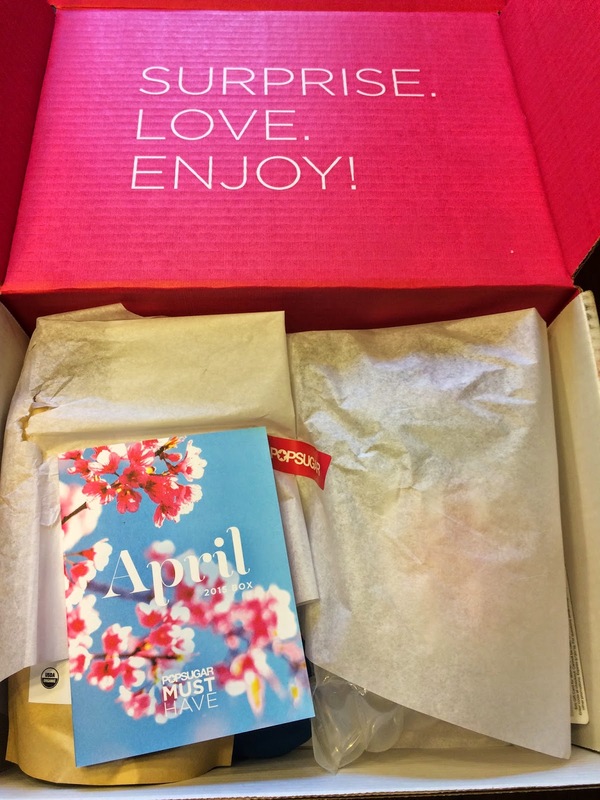 My Popsugar Must Have April box finally arrived yesterday. I had looked at spoilers, so I knew what I'd be getting, but this is still one of my favorite boxes to open up each month. 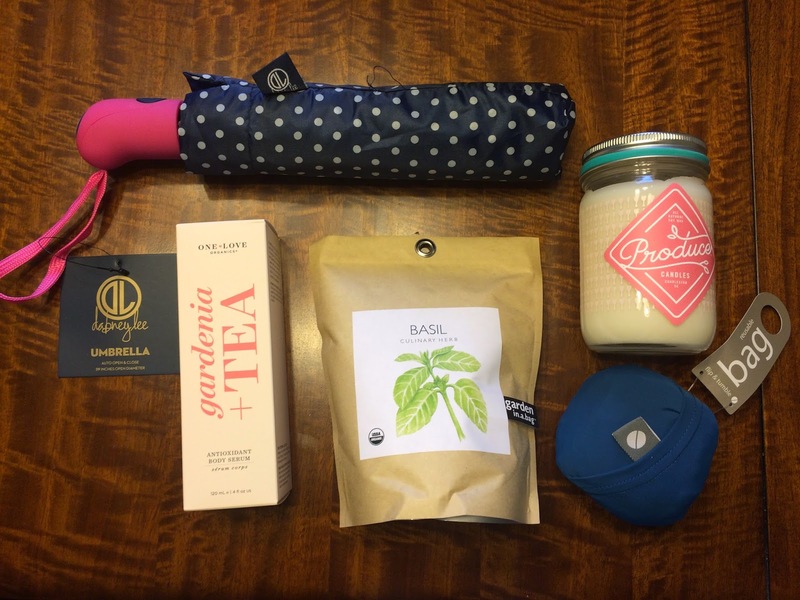 This month I was excited about every single item included. The inspiration for April was Spring Showers, Farmers Market, Outdoor Fun, Fresh Produce, and Simplicity. This box was totally me!!! And I can't wait for farmers markets to open back up in my area. Every item in this box made me think of Spring and being outside after a long long winter, which I was very excited about! As always, Popsugar includes an information card explaining everything included in the box. And here's everything that was in the box! I really love it all!!! I love the themes of the Popsugar boxes lately! 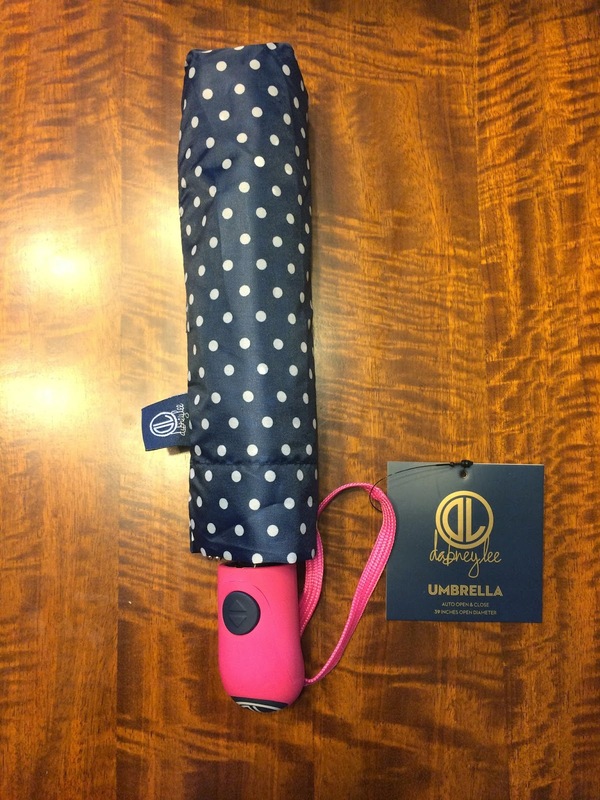 The first item included was Dabney Lee Dottie Umbrella. I would have chosen this umbrella for myself. I love polka dots and navy, so this is totally my style. I love that it has an auto open/close button. I will be using this all spring! 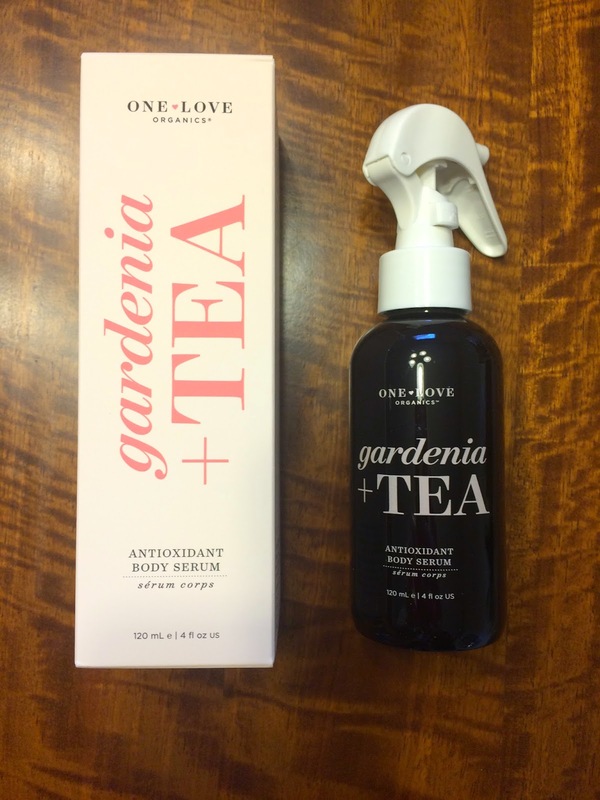 The next item was One Love Organics Gardenia + Tea Antioxidant Body Serum. I've never tried anything by this brand, so I'm interested in trying this. Plus this bottle is so adorable! I love getting new products that I haven't heard of or tried before!!! 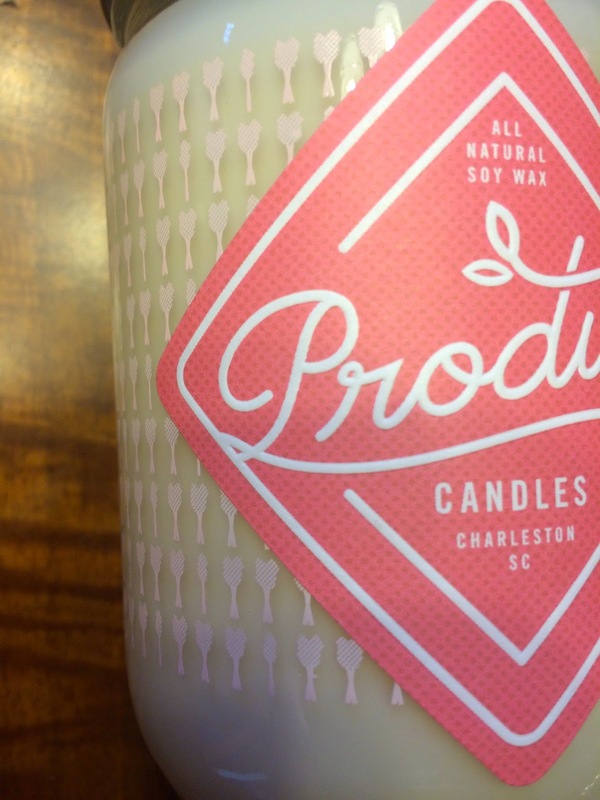 I also received a Produce Candles Rhubarb Spring Candle. This smells amazing! 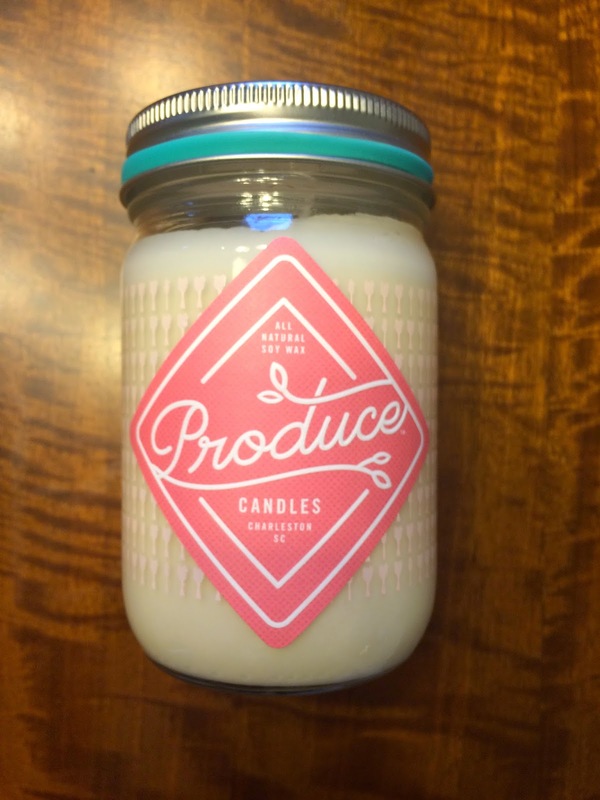 I wasn't sure what rhubarb smelled like, but it's a fresh scent, that's not overpowering. I couldn't stop opening this candle to keep smelling it. And the packaging of this is great! It looks like a canning jar, and has a cute pink arrow detail on the glass. I may be buying these as gifts, because I love this! And I don't usually take pictures of the packaging that things come in, but I had to for this one. Popsugar does a great job of having bubble wrap on items that may break in transit, but this was like nothing I had ever seen before. It reminded me of a bubble suit for the candle. And there was a slit in the front, that you can see from the picture, to get the candle out. Not sure why, but I loved this! 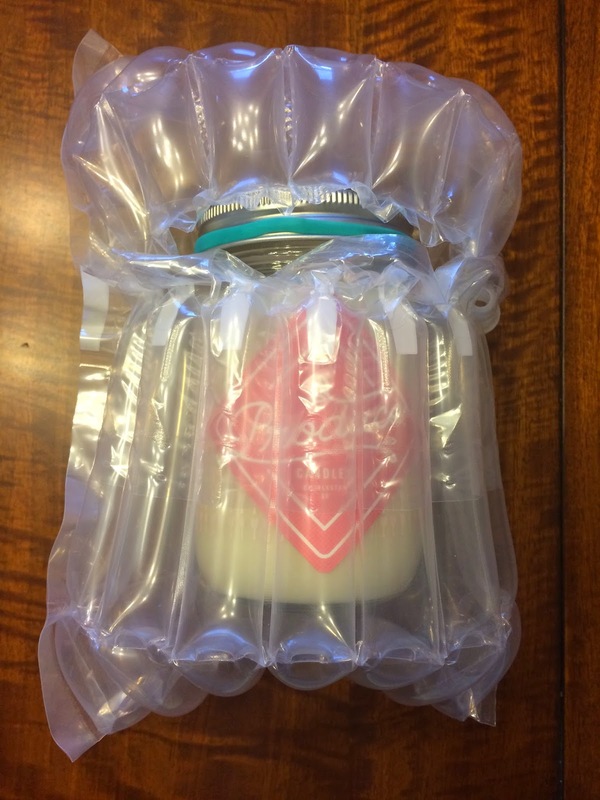 It's like a candle safety suit for shipping and gifting!!! 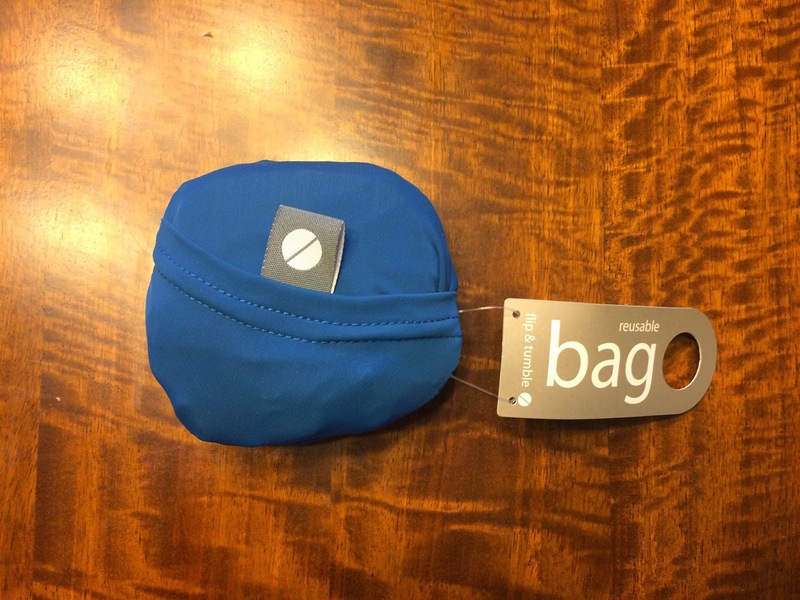 The next item included was a Flip & Tumble 24-7 Bag. I received a blue and grey one (I'm not sure if other subscribers received different colors). 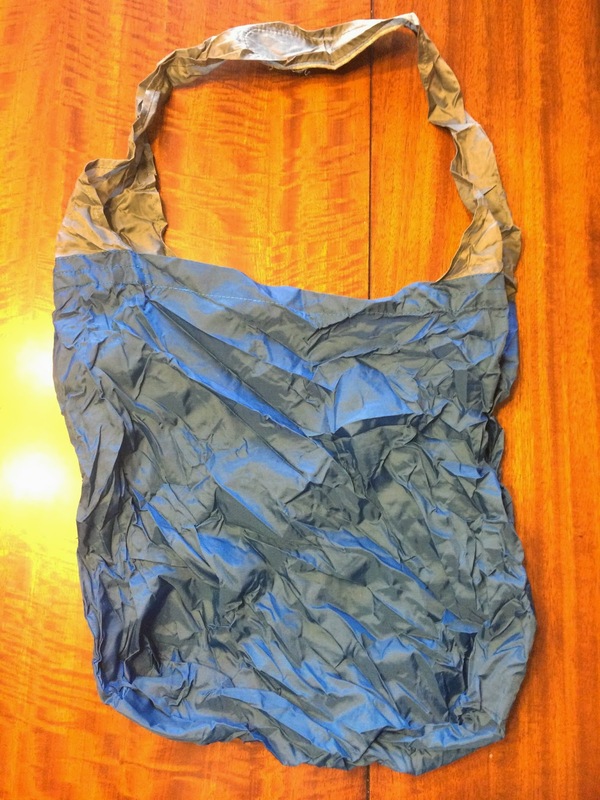 But I love blue and I prefer darker color reusable bags, because light colors do not stay clean long with a 2 year old that loves to help carry the bags. The color in the first picture is a true color of the bag (I may have accidentally taken the second picture of the bag unfolded and very wrinkly with a flash, oops). 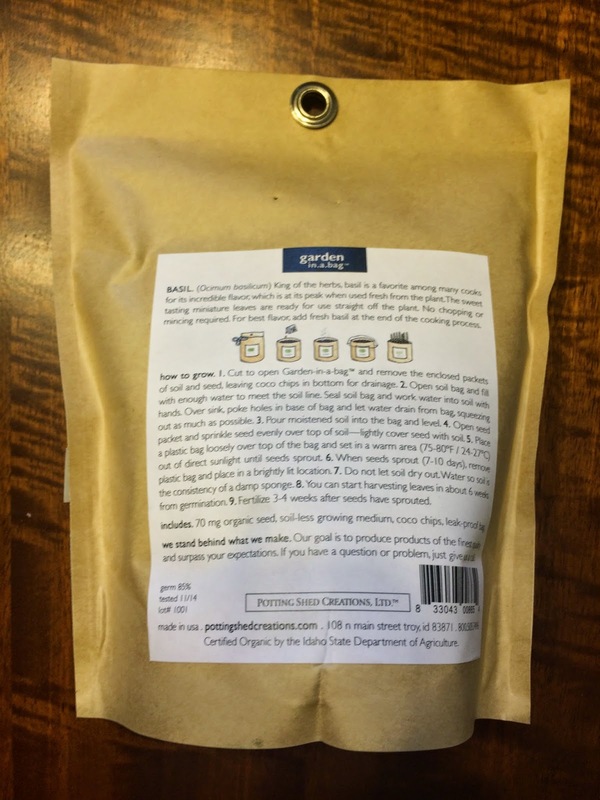 This will be great for farmers markets and I love that you can just ball it back up into the little pouch and don't have to do any origami folding to get it inside. It also has some felt on the shoulder so it feels more sturdy that other reusable bags. This will be perfect and I will use it lots this spring/summer! I'm a bit nervous about the final item, but excited to try it. 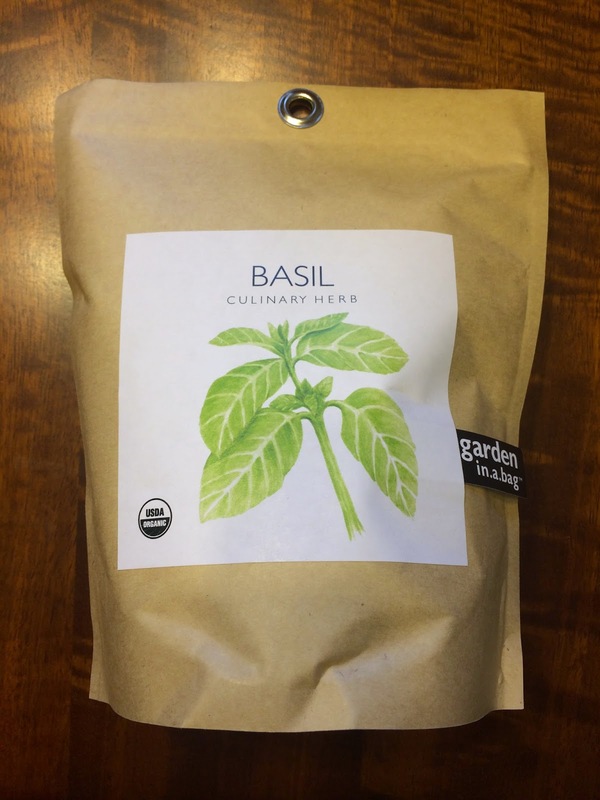 It is Potting Shed Creations Garden in a Bag Basil. I'm no gardener, and I've manage to kill every plant I've ever owned, so this will be a challenge for me. But we just remodeled our kitchen and this will be a great addition to it. Cooking with freshly picked basil would be such a treat! I also love this as a gift idea for people that love to cook! As a special extra this month, Popsugar included a $25 gift card to Mott 50. I had never heard of the company before now, but they sell light weight clothing with 50 ultraviolet protection factor. I'll definitely be checking it out. 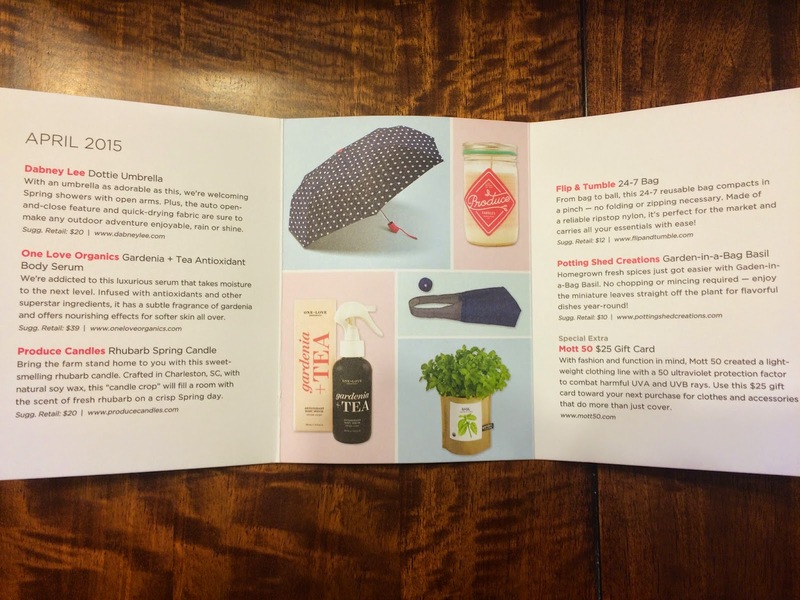 I loved everything included in the Popsugar Must Have April box. I will use everything and even got some gift ideas, for some difficult people to buy for. And Popsugar already released a spoiler for the May box, (my birthday month) which is a beautiful necklace, that I'm really excited for (unfortunately I couldn't find a picture of it)! I believe the May box is sold out currently, so if you subscribe now you'll get the June box. And because I love Popsugar so much, I also purchased the CFDA Popsugar Must Have box, which went on sale April 15th and sold out in less than 2 hours! This is the Popsugar collaboration box with the Council of Fashion Designers of America. I'm happy I was able to snag one and can't wait to see what is in it! It will ship May 15th and I'll be sure to review it!